'Ackee and Saltfish' was the theme for the 'Jamaican Twist' band, at this year's Notting Hill Carnival in London, United Kingdom (UK) recently. The carnival band, which was once again sponsored by the Jamaica Tourist Board (JTB), had costumed performers illustrating Jamaica's national dish. The 'carnival king' wore a spectacular saltfish costume in shimmering blue, surrounded by dozens of female dancers in gold 'ackee' costumes. The costumed performers included eight finalists from the Miss Jamaica UK pageant. The doctor bird and Anansi were other characters brought to life by carnival costumes. The Notting Hill Carnival is the largest festival of its kind in Europe and estimates are that more than a million spectators participated in the two-day event this year. The JTB-sponsored 'Jamaican Twist' band was a crowd favourite as it paraded through west London, with reggae beats and live MCs. The costume section was followed by a T-shirt band of some 40 men, women, and children in customised Jamaican clothing. Reflecting the national motto 'Out of many, one people', participation was open to the public this year and the T-shirt band included persons from the UK, South Africa, Australia, United States, as well as Jamaicans and British Jamaicans. Five travel agents also joined the band after winning places in a competition hosted by the JTB in London. For the JTB, the 'twist' in the Jamaican carnival band was a collection of 40 Brazilian drummers and samba dancers, who completed the parade with electrifying beats and coordinated outfits of green and gold. Notting Hill Carnival is the UK's biggest celebration of Caribbean culture, consisting of 20 miles of colourful costumes and floats, more than 40 static sound systems, hundreds of Caribbean food stalls, and over 40,000 volunteers. The annual Carnival has been celebrated for over 40 years, taking place on the final Sunday and Monday in August. The Jolly Boys also gave a live performance to rapturous applause at the Carnival. The group has had huge success in the UK with their modern mento covers of popular songs including Amy Winehouse's Rehab, Johnny Cash's Ring of Fire and Iggy Pop's The Passenger. The band from Port Antonio, Portland is touring the UK ahead of their Great Expectation album launch. Celebrity chef, Jamaican-born Levi Roots was also at the carnival, where he first made a name with his 'Reggae Reggae' sauce. Patrons eagerly queued for a taste of his Jamaican jerk, while entertained by musical interludes from Roots. 'Jamaican Twist' has announced that its theme for the 2011 Carnival will be reggae legend Bob Marley, to commemorate the 30th anniversary of the singer's death. In 2012, the band will celebrate 50 years of Jamaican Independence. 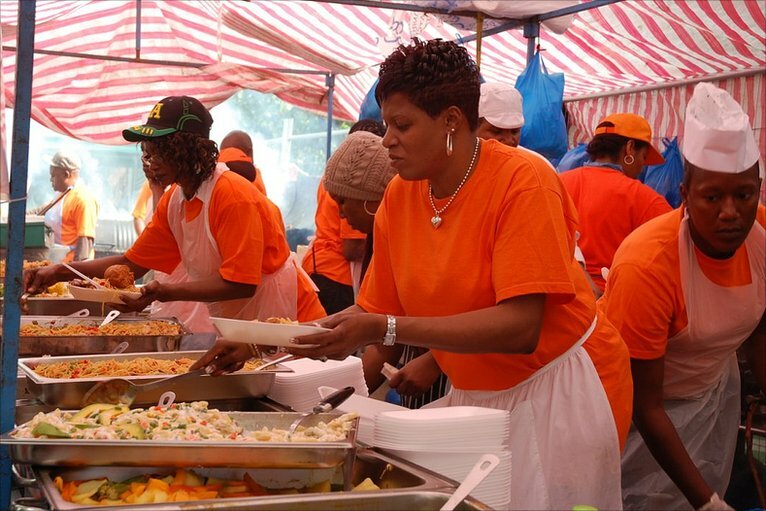 \n\n'Ackee and Saltfish' was the theme for the 'Jamaican Twist' band, at this year's Notting Hill Carnival in London, United Kingdom (UK) recently. \nThe carnival band, which was once again sponsored by the Jamaica Tourist Board (JTB), had costumed performers illustrating Jamaica's national dish. \nThe 'carnival king' wore a spectacular saltfish costume in shimmering blue, surrounded by dozens of female dancers in gold 'ackee' costumes. The costumed performers included eight finalists from the Miss Jamaica UK pageant. The doctor bird and Anansi were other characters brought to life by carnival costumes. \nThe Notting Hill Carnival is the largest festival of its kind in Europe and estimates are that more than a million spectators participated in the two-day event this year. \nThe JTB-sponsored 'Jamaican Twist' band was a crowd favourite as it paraded through west London, with reggae beats and live MCs. \nReflecting the national motto 'Out of many, one people', participation was open to the public this year and the T-shirt band included persons from the UK, South Africa, Australia, United States, as well as Jamaicans and British Jamaicans. \nFive travel agents also joined the band after winning places in a competition hosted by the JTB in London. \nFor the JTB, the 'twist' in the Jamaican carnival band was a collection of 40 Brazilian drummers and samba dancers, who completed the parade with electrifying beats and coordinated outfits of green and gold. \nNotting Hill Carnival is the UK's biggest celebration of Caribbean culture, consisting of 20 miles of colourful costumes and floats, more than 40 static sound systems, hundreds of Caribbean food stalls, and over 40,000 volunteers. The annual Carnival has been celebrated for over 40 years, taking place on the final Sunday and Monday in August. \n \nThe Jolly Boys also gave a live performance to rapturous applause at the Carnival. The band from Port Antonio, Portland is touring the UK ahead of their Great Expectation album launch.\nCelebrity chef, Jamaican-born Levi Roots was also at the carnival, where he first made a name with his 'Reggae Reggae' sauce. \n'Jamaican Twist' has announced that its theme for the 2011 Carnival will be reggae legend Bob Marley, to commemorate the 30th anniversary of the singer's death. In 2012, the band will celebrate 50 years of Jamaican Independence.